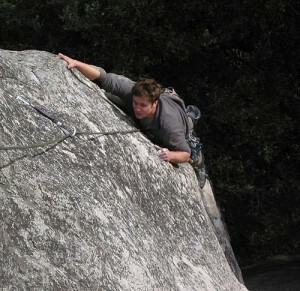 This sporty face climb is usually toproped after climbing Lena’s Lieback or Claude’s Delight. The route starts after the crux of Lena’s Lieback where it traverses right to fun face climbing in a cool position. This climb is for confident 5.10a leaders as there is some big fall potential. If toproping, place gear as a directional 5 feet right of the anchor to prevent a big swing. Which SuperTopo guidebooks include a topo for Goat for It? Mark Miller at the crux of Goat For It.